And a very good evening to you all. It is a distinct honor and a privilege to be here today, to celebrate the auspicious occasion of the birth of the Indian Republic with the inception of its Constitution. Let me begin by conveying greetings and well wishes from the people of the Republic of the Maldives to Prime Minister Narendra Modi and the friendly people of India. President Ibrahim Mohamed Solih also conveys his felicitation and best wishes to the Indian people, the President and the prime Minister of India on this happy occasion. It is a truly extraordinary feat that a country comprised of over a billion people, who speak a multitude of languages and practice diverse customs and traditions, is encompassed by the shade of a single Constitution. India’s vast and regular democratic exercise is a testament to the character and endurance of the Indian people who have maintained a strong democratic tradition, underpinned by the rule of law. As a member of the Special Constitutional Assembly that drafted the Maldivian Constitution in effect today, I recognize that the Constitutions of both our nations share the same underlying spirit and intent; to provide our citizens with the rights and freedoms of a democratic society, and to the values that bind our social fabric. The relations between our two nations extend far beyond bilateral ties and our geographic proximity to one another. It is a bond, forged through years of acquaintance, shared traditions and aspirations. As anyone who spends time in a Maldivian household quickly learns, Indian music, literature, films and food are an inseparable part of our daily lifestyle. This intertwining of our cultures is the hallmark of Maldives-India relations. It is, indeed, a bond among friends. And India has continued to be a consistent and generous friend, who has always come to the Maldives’ assistance when we needed it most. 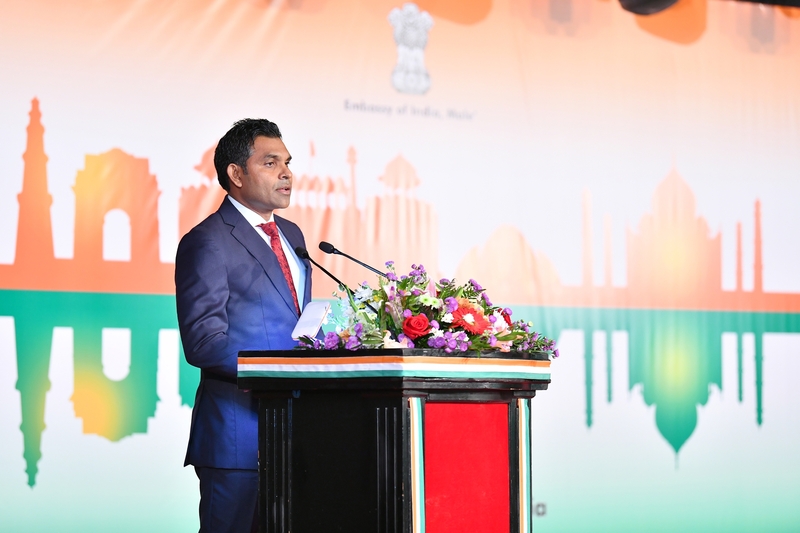 India and the Maldives cooperate on a number of areas. From health, education, technical support, trade, cultural exchanges to the addressing of climate change and ensuring the safety and security of the Indian Ocean region. Here at home, India remains a robust partner in the development of our nation. Indian teachers, doctors, business entrepreneurs continue to make invaluable contributions to the Maldives’ society and economy. Many Maldivians also reside in India, where they study, do business or seek medical services. Several others choose to visit as tourists, to marvel at all that India has to offer. I am happy to note that in the short time since we took office, we have seen a remarkable reinvigoration of our relationship, with the exchange of visits at the highest levels. It was indeed a great pleasure and a great honor to have Prime Minister Modi at the inauguration ceremony, where the President and I, took our oath of office. President Solih was graciously welcomed to India, just a month after taking the Oath of Office, for his first State visit abroad. These mutual visits underscores how deeply the Maldives values our ties with India and this administration’s commitment to ensuring that we can work together in a spirit of friendship for our mutual benefit. Let me once again convey my greetings and best wishes to India on the Occasion of its Republic Day.